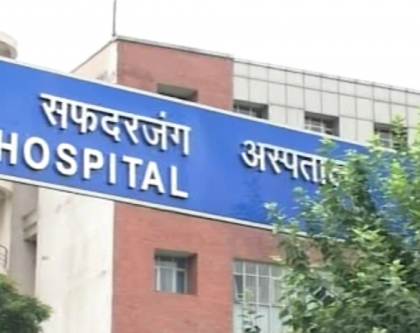 New Delhi: Two resident doctors and a nursing officer suffered burn injuries after a fire broke out Thursday in the new OPD building of Delhi’s Safdarjung Hospital. The hospital administration has constituted an inquiry committee to probe the incident. According to a preliminary report submitted to the medical superintendent of the hospital, Dr Rajendra Sharma, the fire broke out in the eye operation theatre on the fourth floor of the new OPD building during a routine surgery. “During a routine eye surgery at around 12 noon, a fire incident occurred due to the spirit swab getting afire accidentally. While the patient suffered no harm and his operative procedure could be completed satisfactorily, the injured staff were immediately shifted to the burns casualty,” the report read. Three persons, a PG resident doctor (26), a senior resident doctor (30) and a nursing officer (33), “received thermal injuries”. The woman PG resident doctor has suffered five per cent thermal burns and was discharged after first aid, Dr Sharma said. The senior resident doctor with 10 per cent burns on the arms and the nursing officer with 30 per cent burns were admitted to the Burn ICU for observation and required treatment, he said. The burns specialist said they have received second-degree burns and were not in danger. The full recovery might take about a month, the report said. “No maintenance-related issue or lapse on the part of staff, treating doctors or maintenance agency has come to the fore. The fire department was also informed in time,” it said. According to a Delhi Fire Service official, seven fire tenders were rushed to the spot and the flames were doused within half an hour. The official suspected overheating of spirit (chemical) could be the cause of the fire.